A photo of Marsh & Russell taken in the early fifties, with manager Mr Harold D'eath and assistant manager Mr Eric Knight. Photo supplied by James Russell. I remember the first Self Serve proper supermarket opposite Top Rank (Odeon then) it was FINE FARE – does that ring a bell? My friend Geoff who lived at Wiggenhall Road down by the River Colne tried to pilfer a packet of Beech Nut Chewing gum and the manager of Fine Fare saw him, as they had columns in the supermarket with mirrors on all four sides. He caught Geoff at the checkout and advised him to put the chewing gum in the basket! He did and went very red! But he let him off with a quiet ticking off. He was a nice guy. The very first self service store was actually the Co-Op just along from Fine Fare who were technically the first to introduce the idea of helping yourself with a wire basket. They were near to a Stove and Fires shop called oddly Cakebread Robey do you remember them. My mum and dad bought an Esse stove from there. Stan Pike was in that parade too with a Newsagents and Tobacconist. 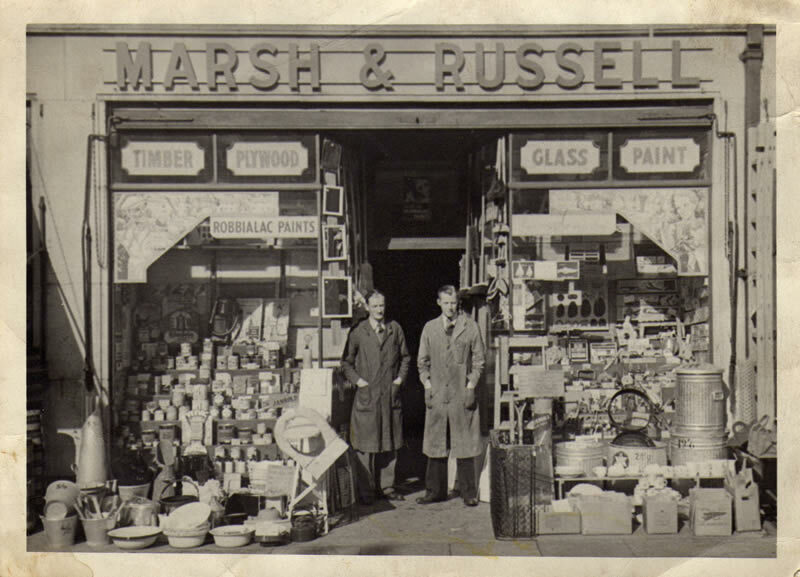 Thanks too to James Russel for that lovely picture of Marsh and Russel store. The store was the best Ironmongers and Hardware in Greater London in my opinion. The Gaumont was a superb cinema where I remember seeing “live” concert by the Dave Brubeck Quartet and his band put on a superb show and Dave complained a few times about the very out of tune piano he’d been expected to play on. Typical of the management not bothering to tune it for an important musician like that. I remember how the audience did a standing ovation for the drummer Joe Morello who gave a 12 minute drum solo towards the end of the concert. Eldorado Ice Cream and Nelsons was the order of the day in Cinemas. It wasn’t as good as Rossi’s but it wasn’t bad. We used to eat Chinese meals at the Kam Wah in Kings Street. Bucks had a fabulous Bakery and Garners. Sainsbury had a shop in the High Street where they cut and shaped fresh farm butter for you and wrapped it in greaseproof paper all neatly folded. Imagine that today in our plastic and throw away society! Peter Spivey Sports shop was on the Parade and I used to buy Air Gun pellets from there. Radio Rentals I bought my first ever HMV Tape Recorder. Oh the memories just keep on flooding in the more I think about it. I think I’d better stop before I explode with nostalgia. Greetings and Best Wishes to all you Watford of old fans out there. RE: Sacha’s comment; everyone is right that Bailey’s/Top Rank etc. were the same location but after these it became Paradise Lost, Destiny, Oceana and currently Prysm. Sacha is referring to Area/Cameo which is located nearer the flyover, next to Gade car park. Top Rank etc. were top end (was also Odean cinema), above Iceland. Unsure of what Area/Cameo used to be; Chicago’s maybe? Although I believe that was alongside the top of town opposite the pond also. My mum worked as a teenager with her cousins in The Oliver restaurant (Jenny Sturgess, Lynne and Sandra Tickner), and then worked with my Dad (Dave Smith) in her teens at BeeJam’s – funnily enough also with her two cousins! So I more or less live in their pasts! Sorry this wasn’t more helpful re: the lower end of the highstreet – it is also the leisure centre/gym currently if that helps. And Nandos! (Was York Furniture store). Seeing Sacha’s comment re Bailesy night club, I only remember is from a very young age as being the Odeon Cinema. I went to Watford Fields Infant and Junior School. My first teacher was Miss Glenister who also taught my brothers Wallie and Trevor, who attended a great many years before me. Headmaster at the Junior school was Mr.Scott who always seemed an ogre to me. I used to climb thru’ the railings to school when no teacher was looking as my back garden backed onto the school. I recall marching around the playground on Commonwealth day, cannot remember whether that was March or May. My senior school was Victoria in Addiscombe Road, headmistress there was Miss Morris. We were told to always walk on the left of the stairs and corridors, which I still do today. Discipline was the word in those days. My first job was at Watford Electric and Mfg Co. in West Watford. I left there to work in the big city, London. I have travelled and lived in a great many places, but still regard Watford as my home! Hi Sacha, If I remember rightly Baileys used to be Top Rank in the early 60’s. I recall when it opened I was the second person in the queue to become a member and I still have my membership card – somewhere. I stand corrected if my recollections are inaccurate. I’m desperately trying to find out what area club/ now cameo club used to be before it was baileys or whatever it was. Years ago. Help! What was the shop called situated around the middle of the High Street that used to have wonderful-smelling fresh coffee wafting from the doorway, and also sold ice-cream cones? – even as a small child walking past with my mother I used to love the smell of the coffee! Also, fish and chips in Cawdells Restaurant was a real treat, followed by strawberry icecream with lumps of ice in it! Watford Pond was beautiful, with the water-lilies and huge goldfish. As I grew into teenage years, going to the Top Rank on a Tuesday and Saturday was always exciting, also the Trade Union Hall, where we saw the Who and the Pretty Things live, before they were really famous!